← The Sports Archives – Back To Reality: What Do Elite Athletes Do When They Retire? The Sports Archives – Rock Climbing For Beginners! Rock climbing is full of fitness, adventure, fun and adrenaline. Many people consider it as a dangerous activity, but the truth is that with proper instruction, practice and equipment, it is a safe sport. Reading articles or viewing instructional videos on the Internet cannot make you a rock climber – to get started, you must practice the activity under the watchful eye of a professional instructor. Indoor climbing walls can be set up in sports clubs, gyms or even in homes. 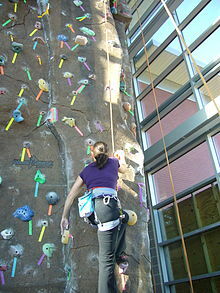 An indoor climbing wall is equipped with foot and hand holds that are placed in such a way that they pose a challenge to the climber. These holds can be adjusted to change the difficulty levels. America has many climbing gyms and clubs, and beginners can start their journey here. Indoor climbing is not impacted by the weather and all climbers can practice in a safe and controlled area. The holds are also visible and every facility has different climbing walls for different climbing skill levels. Bouldering, which involves climbing on rocks that are near the ground. It is performed without a rope and participants climb to a level from where they can comfortably jump to the ground without risking injury. Bouldering requires basic equipment such as climbing shoes, chalk pad and a crash pad. Sport climbing, which requires a rope, climbing shoes, chalk bag and quickdraws. A quickdraw is a sling-like device that connects two carabiners. It helps increase climbing speed and allows climbers to clip bolts efficiently. The lead climber keeps clipping carbiners and quickdraws into anchors (pre-placed) and keeps moving up, with his crew following him. 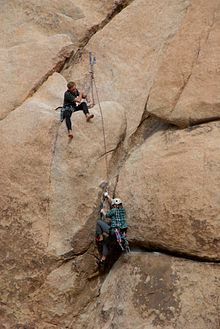 Traditional climbing, which is a really high adventure activity because such climbing routes have very few anchors. Climbers have to insert nuts and other protection equipment into rocks and then remove them and reinsert them as they keep moving up. Carbiners, quickdraws, nuts, protection devices, etc., are used in this type of climbing. Aside from these, there are other types of climbing such as soloing, big wall climbing and ice climbing. Beginners should start by finding other people who share their interest. They should consult a professional coach or join a climbing club. If they are afraid of climbing in the outdoors, they should join an indoor climbing club and learn the art. They can always hit the great outdoors after they have practiced enough. They also must keep physically fit. Aside from practicing, it is important for every beginner to learn the theory of rock climbing and understand the jargon and terminology. Climbing gear does not cost much and basic climbing gear (shoes, crash helmet, etc.) works up to a mere $250 – and it costs lesser for indoor climbers. This is the basic information you need to know about about rock climbing. Robert B. Darnell is an amature climber from Bridgeport, VT who studied mountaineering at the Mountain Training School in Alaska. Top Climbing Destinations Around The World! This entry was posted in Other and tagged big wall climbing, bouldering, fitness, how to mountain climb, how to rock climb, ice climbing, Indoor climbing walls, mountain climbing, mountain climbing blogs, mountaineering, Rock Climbing, rock climbing tips, soloing, Sport climbing, sports and fitness, sports and leisure, sports and recreation, Sports Archives, Sports Blogs, Traditional climbing. Bookmark the permalink. 1 Response to The Sports Archives – Rock Climbing For Beginners!